Aplat makes culinary, wine and garden totes, designed and manufactured with a zero waste approach. Since 2014, their passion is to deliver a meaningful experience in sharing food, wine, and garden that is sustainable from-farm-to-factory-to-table. They support community, thoughtful design, and an evolution in industry practices. Check out Aplat’s website here, their Instagram here, or stop by their table at the SFMade Holiday Fair at CCA on December 16th. We got a chance to speak with Aplat’s Founder and Chief Creative, Shujan Bertrand, in November 2018. Pictured: The Aplat Team. Left-Right: Cindy Shi, Tina Walliser, Shujan Bertrand and Linda Hayes. Shujan, what’s your story, and how did you start Aplat? The story of Aplat was a coalescence of many experiences since meeting my French husband, who truly opened my eyes to L’Art de Vivre – the art of living. One afternoon I was buying flowers and selected a gorgeous wild bundle, which was then wrapped and handed back to me in crackling cellophane. A bit disappointed, I felt the plastic stripped away the beauty I envisioned gifting for a very special occasion. At that moment came the insight to design the first bouquet tote that would be more sustainable, beautiful, and meaningful for gifting nature. My French in-laws were in town that day, and after a few hours of brainstorming at the kitchen table, I had a complete design collection in mind: for flowers, bread and wine, pies and casserole carriers. I was determined to transform and elevate the art of giving, sharing and gathering. Aplat officially launched Fall 2014 with the debut of the Plat Tote, a culinary tote designed to carry and share food with ease and style. This became the first of our four-category culinary design collection. Aplat is still a young company, but we’ve seen steady growth in retail and to trade business channels, always with a zero waste approach. What does zero waste mean for Aplat? I started Aplat with zero waste as a core design principle which I maintain to this day. This means zero hardware (no zippers, clasps or buttons), zero plastic, and zero use of toxic elastic to create functional and beautiful design while working to maintain a healthy and safe planet. This also means precision design and cutting, and zero material waste — less going to landfills. Every inch of fabric yardage is used to make our products and the small off-cuts are used for packaging and designing new products like our Party Pennants. Can you give us a few facts and numbers so we get a better idea of your growth and scale? The first Aplat prototype – the Plat Tote – went from concept to in-store at Heath Ceramics in just six months, followed shortly thereafter by Food52, Healdsburg SHED and Design Within Reach, among others. In three years, over 20,000 products have been sold and we have never had an item returned – only customers returning for more of our collection! Aplat is based on origami design principle and inspired by the golden rectangle – think highly engineered folds to create volume for infinite product creativity. Our patented design approach allows us to eliminate all hardware for superior quality and function to last generations. We recently launched two new product lines. Under the Culinary category, we released the new Couvre-Plat [Dish Cover] in Round and Rectangle. They are uniquely designed with adjustable cinch straps that can tie firmly around any round or rectangle dish, in a variety of sizes to choose from. For the Bread category we also released the Zero Waste Pantry Line of products in many sizes from the Poche Extra Large (Tartine’s Bread Pouch) all the way to the Pochette Extra Small. We are really happy to be supporting zero waste lifestyles with these two new launches this year. They’re made with the same durable organic cotton canvas like the rest of the Aplat line. Think no plastic and no elastic! You can find these at Heath Ceramics, Anthropologie, UncommonGoods and other local retailers nationwide. In 2019, I’m starting a new project – 1 year of Origami Design, a project of 365 Days which will inspire new ideas for Aplat’s product line. Looking further – many years ahead, what does the future hold? My dream is to be a leader in zero-waste-design and manufacturing, for Aplat and other companies in cut-sew industry. Before I put a product into production, I think a few decades ahead. My wish is that people will continue to love Aplat for generations to come. My goal is to work with material and manufacturing that will be environmentally responsible for my children and grandchildren. Creating something new yet timeless is my purpose. I strive for simple classic, geometric shapes, applied with an origami volume approach to every product I design. Our designs embrace a more sustainable future, designed to conserve and replenish limited resources by using them more wisely and efficiently. I want to gravitate the textiles industry toward more responsible, sustainable practices, paving the way to zero waste manufacturing through smarter design principles. In order to design with greater empathy and efficiency, it’s important that I’m close to the manufacturing process. My factory is across the street from my studio and my cutters and sewers are a part of the Aplat family. Together we collaborate almost daily to improve and evolve our products at each stage of production. 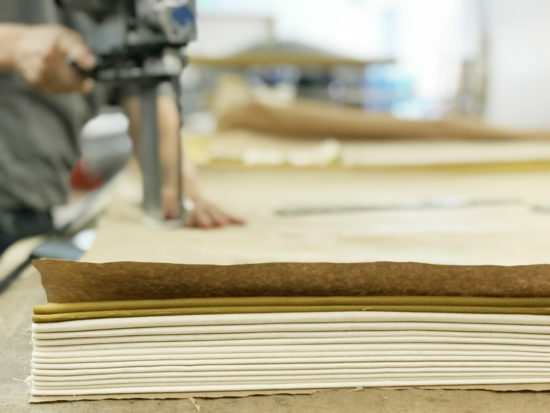 With the factory so close, I’m also able to understand the impact of material waste and strive for zero waste design strategies for manufacturing. I’ve been a fan of SFMade for quite some time — ever since my industrial design days, designing and consulting for corporate brands. While developing my first Aplat product, I became a member and enrolled in your manufacturing classes. SFMade offers wonderful tools and resources for the maker community, and most recently, we found our first part-time staff member through you. The process was seamless and we’re happy we found the perfect person to grow our team!